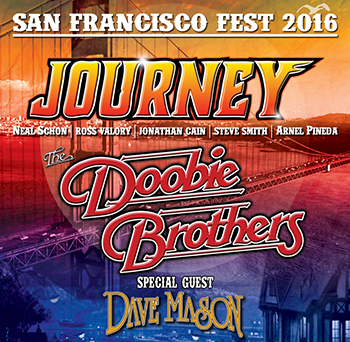 LOS ANGELES, Nov. 24, 2015 /PRNewswire/ – JOURNEY and THE DOOBIE BROTHERS will launch the SAN FRANCISCO FEST 2016 tour on Thursday, May 12, 2016, again bringing together two of the iconic groups that helped define the “San Francisco Sound.” The tour, produced by Live Nation, launches at the Irvine Meadows Amphitheatre in Irvine, California – with concerts scheduled through Tuesday, August 30, 2016, and includes special guest DAVE MASON. A full listing of tour dates can be found below. Tickets go on sale to the general public beginning Saturday, December 5 at 10:00 a.m. through LiveNation.com. Fans with the Live Nation mobile app will have access to a password-free presale starting Thursday, December 3 at 10:00 a.m.* The app is available via the iTunes App Store and Google Play. Neal Schon (founding member and lead guitarist), original member Ross Valory (bass), and longtime members Jonathan Cain (keyboardist) and Arnel Pineda (lead singer), are welcoming virtuoso drummer Steve Smith back into JOURNEY, marking the first time he will perform with the band since 1998. Schon and Smith have always remained close friends and musical collaborators. Smith has lent his incredible talent to several of Schon’s solo albums, including critically acclaimed The Calling, and, most recently, Vortex. JOURNEY is one of the most popular American rock bands of all time, creating some of the best-known songs in modern music, with iconic hits such as “Lovin, Touchin’, Squeezin’,” “Faithfully,” “Lights,” “Any Way You Want It,” “Stone In Love,” “Who’s Crying Now,” “Wheel In The Sky,” “Open Arms,” “Separate Ways,” “Only the Young,” “Be Good to Yourself,” and the seminal “Don’t Stop Believin’,” which is the top-selling digital catalog track in history. Since its formation in 1973 in San Francisco, JOURNEY has sold 80 million albums worldwide, earning 19 Top 40 singles and 25 gold, platinum and multi-platinum albums since. VH1 named the group one of the top 100 artists of all time. The Greatest Hits album is certified 15 times-Platinum, bringing Journey into the elite club of Diamond-certified holders. In 2007, Neal Schon discovered Arnel Pineda on YouTube and succeeded in making Pineda the new lead singer. Two albums and three major tours later, JOURNEY has toured four continents and performed for nearly three million fans, earning the group Billboard’s prestigious “Legend of Live Award.” They received a star on the Hollywood Walk of Fame and VH1 has named the group one of the top 100 artists of all time. Legendary rocker DAVE MASON has an illustrious career spanning nearly 50 years, encompassing producing, performing, and songwriting. Best known for his soulful voice and unsurpassed guitar playing, Mason was inducted into the Rock and Roll Hall of Fame as a founding member of the group Traffic, and continues performing as a solo artist with sold out shows all over the world. Over his career he has penned over 100 songs and hit singles including “Feelin’ Alright,” “We Just Disagree,” “Only You Know and I Know,” among others. Mason is a true classic rocker who has collaborated with numerous members of rock and roll elite, including George Harrison, Stevie Wonder, Michael Jackson, and many more. When Dave is not touring he continues writing and producing new music in his home studio, as well as tirelessly supporting philanthropic causes near to his heart: Work Vessels for Vets, Yoga Blue, Michael Bolton Charities, and Kid’s Rock. For more information, visit http://journeymusic.com, http://doobiebros.com and http://www.davemasonmusic.com/. +JOURNEY with Neal “Vortex” Schon only on this date.